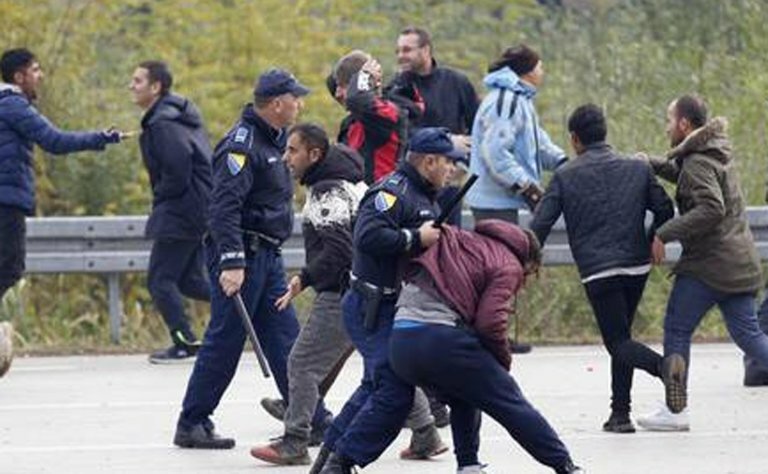 On the border between Bosnia and Croatia, hundreds of migrants trying to reach Croatia have clashed with the police. High tension was seen on Thursday between Bosnia-Herzegovina and Croatia, where hundreds of migrants pushing to enter Croatian territory clashed on Wednesday with police from both countries. Shouting 'Open border, open border', the refugees pushed through an initial cordon of Bosnian police at the Maljevac border crossing not far from Velika Kladusa (northwestern part of Bosnia), but were held off by a second barrier of policemen. Some migrants were injured in the clashes and the border crossing was closed to traffic for a long time. The night between Wednesday and Thursday was calm after a brawl broke out between migrants. Bosnian police ordered to move the tents of about 250 migrants that had remained near the border crossing. The Croatian border police decided to set up a barrier along the border to prevent further attempts by migrants to force their way across and enter illegally into the country. Croatian police - backed by helicopters surveilling the entire border area - then made use of tear gas in response to the violent throwing of stones and other objects by migrants stuck a few meters away in a 'no-man's-land'. At least two Croatian suffered minor injuries. Meanwhile, further south, at another border crossing in Bihac, the situation was resolved concerning about a hundred of migrants stuck for hours on a train that had arrived over the night in Sarajevo. The Bosnian police stopped them from getting off to prevent also them from heading towards the border with Croatia. Following moments of severe tension, the decision was made to take the migrants off the train and transfer them onto two buses that took them back to the Bosnian capital. The operation was accompanied by a large number of policemen but was conducted calmly and without incident. In the evening, other migrants who had paid for their train tickets left from Sarajevo towards Bihac, where the situation is relatively calm. Tension instead remains high at the crossing at Velika Kladusa, where hundreds of refugees that had been involved in the clashes do not intend to pull back and instead decided to spend the night in the open air, camped out in tents and makeshift shelters. The situation is reminiscent - on a lower scale - of one seen a few years ago on the border between Serbia and Hungary, at the apex of the migration crisis along the 'Balkan route'. On Wednesday evening, Croatian president Kolinda Grabar-Kitarovic met in Zagreb with Interior Minister Davor Bozinovic, with whom she discussed the tense situation along the border. The minister ensured her that the police had the situation under complete control and that they were prepared to intervene to stop acts of violence and attempts to illegally enter Croatia.